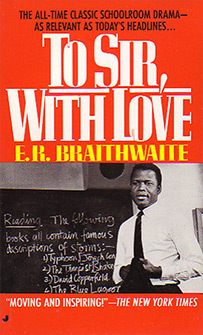 To Sir, With Love is an inspiring autobiographical novel set in the East End of London based on true events concerned with Braithwaite taking up a teaching post in a school there. The book was made into a film in 1967. Braithwaite captures the shame and hatred of prejudices and racism. The journey begins in the East End of London, during the 1940s. Mr. Braithwaite teaches at Greenslade School, which is surrounded by poor neighborhoods filled with social vermin. Rick Braithwaite is a young black man, born in South America, who just got out of the Air Force. Now in Britain, Braithwaite’s looking for a career, mainly to pay for food, but things don’t work out as planned. He came to know the virus of prejudice very well, as he was turned down from job after job. Braithwaite described feeling “caught like an insect in the tweezers grip of prejudice.” Teaching became the cure to set him free. Braithwaite is placed in a classroom full of rude, obnoxious children, but little does he know that these are the children who will change his life. In the beginning, he described that he wanted this job, “but it would be a job, not a labor of love.” Then, after spending time with the students, Mr. Braithwaite began “learning from them as well as teaching them.” The class may have problems in their home lives, but when they enter the classroom, Mr. Braithwaite joins them on a journey to adulthood. The students ask many questions, which allows them to acquire the knowledge they deserve. On occasion the questions touch upon people of different races, and Mr. Braithwaite gives mature answers, and speaks to them as adults. Braithwaite’s theory is to treat his students older than they are so they will behave more grownup. With a teacher who respects his students, they, in return, accept him and honor him with the courtesy of “Sir”. Edward Ricardo Braithwaite is a Guyanese novelist, writer, teacher, and diplomat, best known for his stories of social conditions and racial discrimination against black people. He was born in Georgetown, Guyana. Braithwaite had a privileged beginning in life: both his parents went to Oxford University and he describes growing up with education, achievement, and parental pride surrounding him. He attended Queen’s College, Guyana and then the City College of New York (1940). During World War II, he joined the Royal Air Force as a pilot - he would later describe this experience as one where he had felt no discrimination based on his skin color or ethnicity. He went on to attend the University of Cambridge (1949), from which he earned a bachelor’s degree and a doctorate in physics.